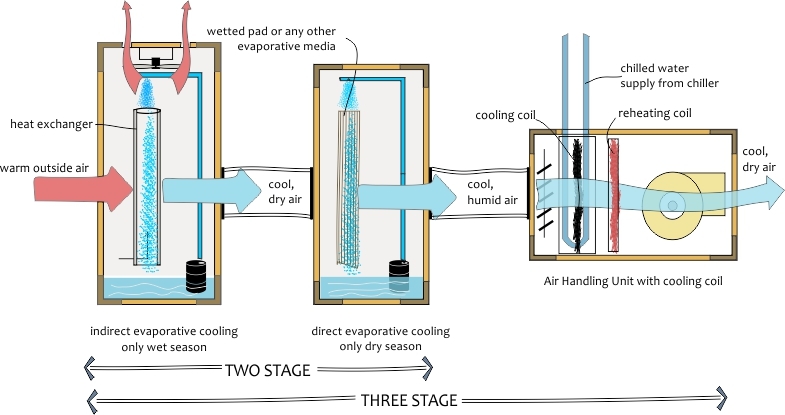 Schematic diagram of a multistage evaporative cooling system. A multi stage evaporative cooling system can work according to the humidity of ambient and humidity desired for supply air. 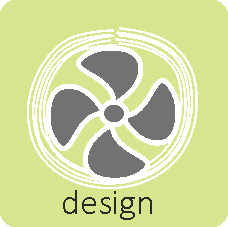 When the relative humidity of ambient air is high, only indirect cooling can be used. This reduces the air temperature of supply air, but the humidity remains unchanged. When increase in humidity is also desired, as in dry hot seasons, direct evaporative cooling can be used. Evaporative cooling is a mechanism traditionally used to provide thermal comfort in hot and dry regions. The mechanism involves sensible and latent cooling of air with water. Direct evaporative cooling is most effective when the outside condition is dry and below the desired conditions. Indirect evaporative system is used during the seasons when little or no humidification is required i.e. when outside air humidity is within a comfortable range. Fresh filtered air is made to pass through a dry section of the system to cool the air through sensible heat transfer. Stage wise evaporative cooling systems can be either two stage or three stage. Two stage evaporative cooling systems (direct + indirect) – the direct system could be functional during the dry season, when humidification of air is required, and indirect system can be used when air primarily needs to be cooled. Three stage evaporative cooling system (direct + indirect + cooling coil) consists of direct and indirect evaporative cooling together with conventional cooling coil. The addition of cooling coils (chilled water or refrigerants) is helpful in monsoon season when the humidity level is high and dehumidification is required. Fresh air passed through the coils controls both sensible and latent heat requirements. The coils are also useful in winter season when some heating is also required. The drawback of the two stage system is the high humidity level of the supply air. Over a period of time indirect evaporative cooling systems which provide sensible cooling of the air without humidification have emerged in the market. System consists of a direct evaporative pre cooler which provides cool and wet air to indirectly cool down the primary air in the tube bundle heat exchanger. The cool and dry air is then passed through a direct evaporative cooler to humidify it. System Performance Energy consumption in the hostel building is estimated to have been reduced to 1/3rd of a similar building with no major energy conservation measures and using conventional air-conditioning systems. Indoor temperatures were measured to be between 31 °C to 34 °C when the ambient was approximately 44 °C.